A new study commissioned by the Marriott Rewards credit card from Chase gave travelers the opportunity to stretch their imaginations by asking them to predict what travel would look like in 2030. They did not disappoint, saying that they expect to be able to vacation in space, engage holographic personal trainers and book stays at underwater hotels. Technology led the way when travelers imagined their future experiences. Instead of digging out your dog-eared passport, 58 percent believe, you’ll be able to scan a digital one, or skip it all together by using face recognition technology. When you get to your hotel, you’ll be able to chat with a 24/7 virtual concierge, according to 61 percent of the participants. If you want to work out while on vacation, you can click a button and get started with a holographic trainer. And for seeing the sights around town, personalized mobile travel guides will offer tours and get you where you want to go. 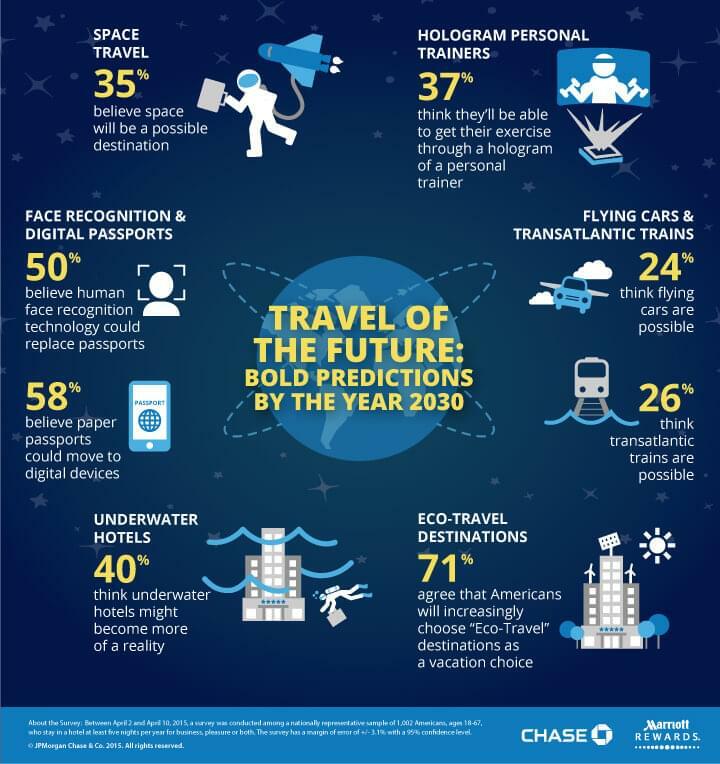 Where will travelers in the future go? Outer space, of course. That’s according to 35 percent of the respondents. But space isn’t for everyone. More participants, 71 percent, believe that eco-travel destinations will be very popular in the coming decades. A little more than half of the respondents expect extreme hotel experiences to be all the rage, including staying in a private hut perched over the ocean or zip-lining to a tree house. Don’t forget about underwater hotels. They’re on the future travel list too, with 40 percent believing that they are a very real possibility in the next 15 years or so. Despite the bold predictions, respondents were slow to believe that trans-Atlantic trains (26 percent) and flying cars (24 percent) will be a reality anytime soon. For the study, Marriott and Chase surveyed 1,000 travelers between the ages of 18 and 67 who spend at least five nights per year in a hotel.